All apologies for making this so stupidly simple, but this truly is a simple award. You give the Most Valuable Player award to the player that has played the best basketball during the regular season, and LeBron James clearly played the best basketball of any player in the NBA this year. This is why, according to the Associated Press, he will be awarded the MVP trophy on Saturday. Gotta get it in before the Indiana Pacers sweep LeBron's Miami Heat out of the playoffs, y'know. To consider any other candidate was to be charitable to that runner-up at best. Other NBA players have had MVP-level seasons in terms of production, and there certainly have been several players this season that have been just about invaluable to their respective franchises, but James was so far and away the best player in the NBA that even L.B.J. fatigue -- James has won the award three times in four years -- couldn't sway the vote. James averaged 27.1 points this season on just 18.9 shot attempts a game, which is nearly (by .1 of a shot) a career-low. To put that in perspective, Kevin Durant averaged 28 points on 19.7 shots a night, and Kobe Bryant managed 27.9 on 23 shots a contest — and we don't want to hear about Heat helpers in comparison to teams that feature Russell Westbrook, James Harden, Pau Gasol and Andrew Bynum. James also contributed 14.1 rebounds/assists and 2.7 steals/blocks, numbers that far outpace his contemporaries in whatever the hell position James plays these days. This isn't to dismiss the candidacies of Durant or Kevin Love or Chris Paul. All three had fantastic seasons, and in the case of CP3 (especially) and Durant (sorry, Kevin) MVP-worthy seasons. Still, James was so good — his Player Efficiency Rating (which varies from site to site) in the low 30s resembled Michael Jordan-esque levels -- that the only reason to get into any attempt at an argument over the award is merely to fill up talk radio or cable TV airtime. From there, you get to the nasty bits. James' work in the waning moments of close NBA games since his first few years with the Cleveland Cavaliers has been superb. He doesn't quite boast Kobe's array of game-winning shots, but he also doesn't boast Bryant's propensity to miss 70 percent of his shots in those moments, while also adding actual assists to the ledger. With that in place, James' inaction down the crucial stretches of deciding playoff games and series in the 2009, 2010 and 2011 playoffs likely cost his teams championships. He was the best player on the floor, but didn't play like it. He faded to the background -- though admittedly against superior teams -- and he should be rightfully criticized for his play. If he pulls the same thing later this month or in June, we'll be the first in line to point out where he went wrong. This is a regular-season award, though. And it's not devoted to the player you respect the most, or would start a team with, or would want on your side "when the going gets tough." Basketball is tough, and James played it better than anyone else did this season. It is very much possible for him to keep winning deserved MVP awards while failing his team down the stretch of deciding playoff games. These pages are big enough to supply you with breathless detailing of his dueling realities. We'd just like it if one of those realities — the one that sees him falling short when it counts the most — would become a little less pronounced. 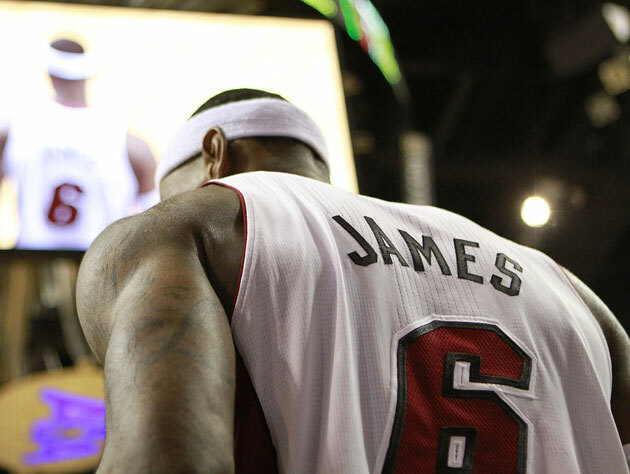 For now, until James rights that nagging legacy, we really should appreciate what a season this has been for him. All-world defense, startlingly efficient offense that often seems made up on the fly, surrounded by teammates that are still trying to figure out ways of succeeding -- with two possibly too-similar players working on the court at the same time in James and Dwyane Wade. James had a legendary regular season, and yet it still feels as if he's scratching the surface. MVP again, as he should be for the next half decade. Because this isn't going anywhere.